As of July 2017, the roads within the RV Park are paved with asphalt. Please fill out the form below to receive a response regarding your stay in the RV Park - we must check availability for your specific date and amp needs first before we can confirm your stay. Whatever your entertainment needs may be, they can be easily met in the area surrounding Agricenter International. Within a five mile radius, you will find easy access to both I-40 and I-240. Fishing, hiking and biking trails, and wildlife observation areas surround the RV Park, ideal for outdoor enthusiasts. The Wolfchase Galleria Mall, three movie theaters, and many restaurants are also within 5 miles. 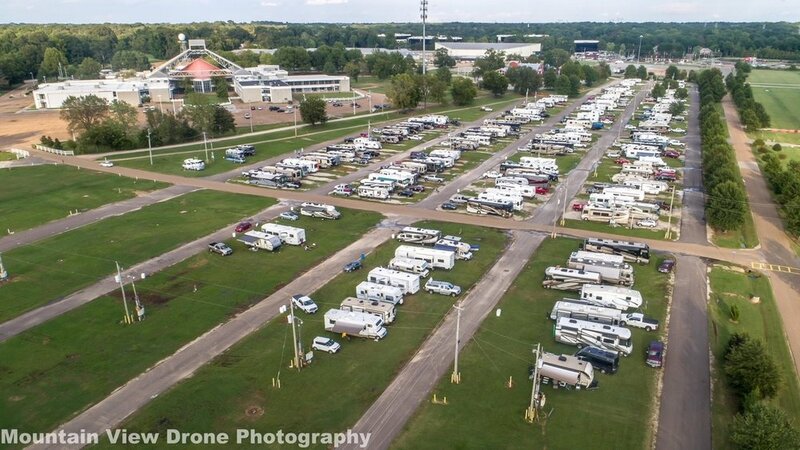 The adjacent convention facility makes Agricenter the ideal location for motor home shows, corporate meetings, RV rallies, and conventions. Advance reservations are appreciated for full hook-up sites. To request a reservation, please fill out the form below and the manager will respond to your request shortly after checking on availability. Check-in time is 11am-7pm (or dark, which ever comes first). EITHER CALL OR FILL OUT THIS FORM BELOW, BUT DO NOT DO BOTH. If you are planning on arriving today, please call Mark Hoggard and leave a voicemail (901-355-1977). As an alternative option, if you would like to use Roverpass and pay through them, skip the form to the left and click this link instead. Please note that it will put your request into our system but you will not be fully registered until approved by the park manager. Roverpass will charge a processing fee that will be above Agricenter's normal fees. If you are arriving today, you cannot use this feature and must call instead: 901-355-1977. What state is your permanent residence? Thank you, your email has been received. We will be in touch with you shortly. Agricenter International, Inc. ("Agricenter") operates a commercial recreational trailer park ("RV Park") located in Shelby County, Tennessee wherein safety and enjoyment for all occupants are paramount and, in furtherance thereof, these Agricrcenter RV Park Rules have been established. Quiet Hours: A state of general quietness will be observed between the hours of 11 p.m. and 8 a.m.
a) Every RV entering premises must be in good working condition with NO DAMAGE or LEAKS of any kind. b) No repair work is to be done onsite. Sewer and Water connections must be properly fitted and supported to prevent leaks. a) All sites must be kept neat, clean and orderly. Please properly dispose of all trash. b) Please use designated parking spots. c) No clotheslines or clothes may be draped around the site. d) Firecrackers, Firearms, or explosives of any kind are not permitted. g) No commercial business is to be operated on Agricenter RV Park grounds. Parking: Two (2) vehicles may be parked at the designated site if space permits. Animals: This RV park is pet-friendly, however, the animal(s) must be on a leash when out of your vehicle and you must clean up after your animals. Animals are not to be tethered to the outside of your vehicle when you are not present. Law Enforcement: If Law Enforcement Representatives are ever called to your site, as a result of a complaint or disturbance, this will result in an automatic termination of your license to rent an RV space, and you will be asked to vacate the RV Park. Payments: All amounts to be paid are due and owing upon arrival to the RV Park. Liability: Agricenter assumes no responsibility whatsoever for private property left on Agricenter property; and Agricenter is expressly released and discharged from any and all liability for any loss, injury or damage to person or property which may be sustained during the term of this license. Agreement: The occupant must sign a license and agree to abide by all RV Park rules as set forth in this document prior to use of a designated site.